Where Was Graeme Thorne Found? 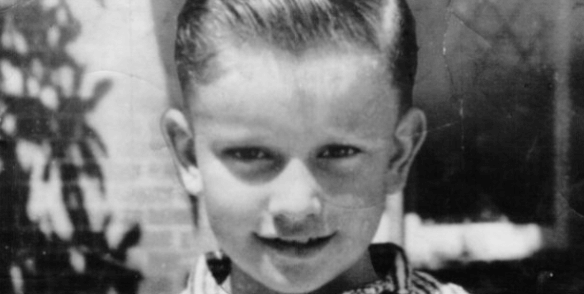 In 1960, eight-year-old boy Graeme Thorne from Sydney, Australia, was the victim of greed-fueled crime that captivated the nation and changed lottery laws forever. The abduction and death of Graeme Thorne is Australia’s first known child kidnapping for ransom case. Motivated largely by greed, the perpetrator targeted the only son of the Thorne family specifically because they had just won the top prize at a local lottery. Find out more about the of events surrounding Graeme Thorne’s murder in the sections below. You can also read more about other lottery stories turned tragedy here. The Thorne family consisted of Bazil Thorne, his wife Freda, and their three children Cheryl, Graeme, and Belinda. They lived in a rented house in Bondi, a suburb in Sydney. Bazil worked as a traveling salesman. The oldest of the siblings, Cheryl, had a disability and was permanently institutionalized. On June 1, 1960, after playing Lottery 10 of the Sydney Opera House Lottery, Bazil Thorne was contacted by a reporter and learned that he had just won the A£100,000 first prize (equivalent to almost A$3 million today). Their family became instant celebrities soon after. In those days, protecting the privacy of lottery winners wasn’t really something people considered. Winners’ stories were regularly published on the front pages of local newspapers, and Thorne’s big win was no different. His identity, home address, private details, and even the date he would claim his prize were all made public knowledge. It was five weeks later when this failure to protect the Thornes’ anonymity led to one of Australia’s most infamous crimes: The kidnapping and eventual murder of Graeme Thorne. On July 7 at around 8:30 AM, Graeme Thorne, 8 years old at the time, was on his way to meet family friend Phyllis Smith before going to school at The Scots College in Bellevue Hill. It was part of their daily routine, but Graeme failed to show up that morning. This prompted Smith to search for Graeme at his home and school. She also went back to their usual meeting spot to check a second time, but was unsuccessful in locating the child. Eventually, this led to Graeme’s mother, Freda, contacting the New South Wales Police Force to report her missing son. Police officer Sergeant Larry O’Shea of the Bondi Police arrived at the Thorne residence within an hour. Not long after, the Thorne’s telephone rang. The call was from a man who claimed to have little Graeme. Police began their investigation immediately. They launched search operations around Graeme’s school and its nearby areas. They also knocked door to door in the surrounding neighborhoods to find information and possible witnesses. Later that same day, they held a televised press conference and appealed for the public’s help in finding the young boy. Volunteers offered their help in finding Graeme, and hundreds of calls with possible leads and tips came in within hours. Local authorities and various police stations pooled their resources to join the effort. The search would eventually grow to become one of Australia’s biggest manhunts ever. After weeks of searching and following different leads, police eventually discovered what had happened to the missing boy. At this point, the story had already captured the entire nation’s attention. It was a dark day for the Thorne family and the people of Australia on August 16, 1960. Graeme Thorne’s body was found on a vacant spot of land in Grandview Grove, Seaforth, wrapped in a blanket and wedged under a rock. He was still dressed in his school uniform, but was missing his right shoe. A scarf had been used to prevent him from screaming. His body was discovered by two other boys, Philip Wall and Eric Coughlan, both aged 8, and their fathers. The young boys were apparently Graeme’s playmates from the neighborhood. An autopsy established that Graeme died within 24 hours after his abduction. His death was ruled to have been caused by a blow to the head which fractured his skull, or asphyxiation due to being gagged, or a combination of both. Forensic evidence including unique cypress foliage and pink mortar were found on his body, clothing, and the surrounding crime scene. These, in combination with various eyewitness reports, eventually led authorities to finding the killer. After releasing details of the case to the public, the police were eventually tipped off to the home of one Stephen Leslie Bradley, a Hungarian immigrant who lived in nearby suburb, Clontarf. Bradley’s home had similar cypress foliage and pink mortar to the ones taken from the crime scene. 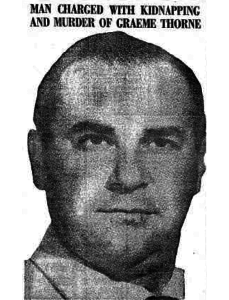 Later reports also showed that that the Witnesses also placed Bradley and his blue 1955 Ford Customline at various times near the Thorne residence before and during the day of Graeme’s disappearance. It was enough evidence for the police to arrest him. On October 3, they visited Bradley’s home to bring him in, but found the place to be empty. The Bradleys had apparently fled the country. Fortunately, the police were able to thwart his escape and captured him as he stepped off a ferry in Colombo, Ceylon (Sri Lanka). Bradley was extradited back to Australia on November 18. In the following year during his trial, Bradley pleaded not guilty to murder. He did, however, provide details of the abduction – recounting how he was able to convince Graeme to get in his car, and the events that transpired which led to the boy’s death. He showed little remorse for what he had done. The trial lasted 8 days, and Bradley was eventually found guilty by a jury. He was sentenced to life in prison in March 29, 1961, and died while incarcerated from a heart attack on October 6, 1968. His wife Magda was never proven to have been involved and was never charged with a crime. 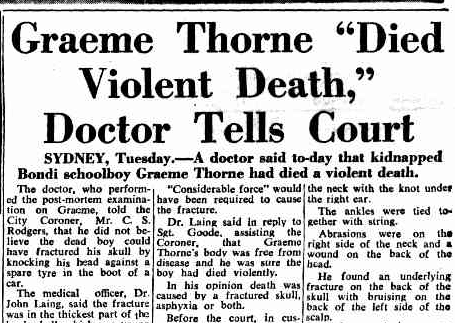 The death of Graeme Thorne was one of a few highly-publicized crimes that took place in the 1960’s and shook the Australian people to its core. Sparking shock and outrage from across the nation, the gruesome murder would eventually force lawmakers to reassess how lotteries operate in order to better protect their winners. It was also the catalyst for amending Australian laws to include harsher punishments for kidnapping. Today, partly because of this tragic tale, Australian law now gives lottery winners the option to protect their identities and remain anonymous.